Enterprise Architect allows processes to be modeled and these models can be analyzed to assess them for how effective and efficient they are and to view any opportunities for change or improvement. There is a powerful element discussion facility allowing modelers to discuss processes and analyze the processes collaboratively even when the modelers are geographically dispersed. Enterprise Architect also has a powerful simulation facility to simulate the models and derive information about the models identifying any points in the process that can be improved. 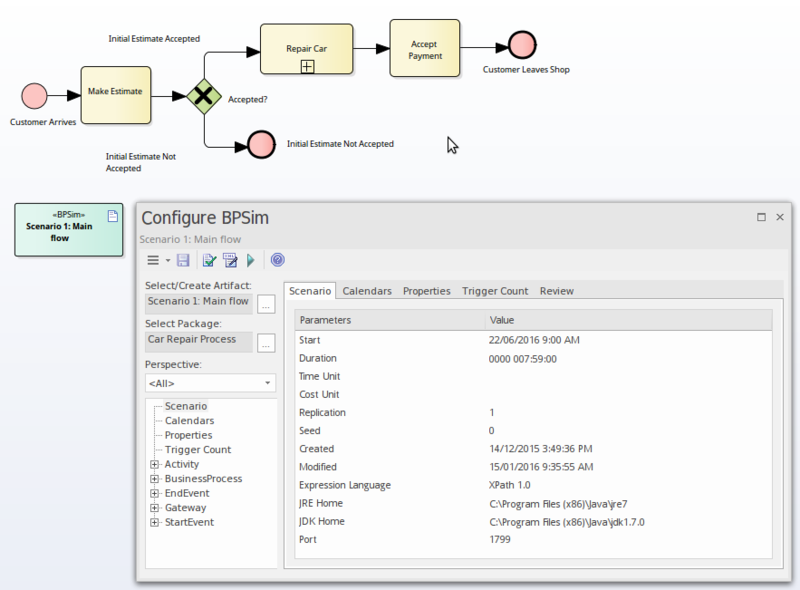 The BPSim facility provides a way of simulating processes written in Business Process Model and Notation (BPMN), providing valuable results that can be used in process analysis. The BPMN models are augmented with extra data as parameters to the simulation. It allows structural and capacity analysis to be performed, providing for pre and post execution optimization. Enterprise Architect allows you to construct the Process models and enter the appropriate data, which is then sent to an internal or external BPSim Simulation engine. The Element Discussion window is a convenient facility that allows commentary to be made on processes (or any element) without contaminating the notes with discussions that ultimately don't contribute to the integrity of the model. 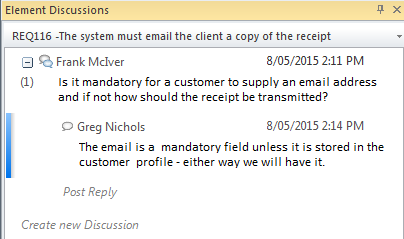 The Element Discussion window allows a modeler to initiate a discussion and for others to reply. It is a perfect way for stakeholders and analysts to discuss aspects of a process as its being analysed. A Discussions summary window conveniently displays the Discussions for all elements in the repository. Element Maintenance Items can be used with Business Processes to capture problems, changes, issues, tasks, events and decision that affect an individual Activities or whole Processes.